A Harrier II+ ‘radar bird’ of Marine Attack Squadron (VMA) 542, ‘Flying Tigers’ based at Marine Corps Air Station Cherry Point, North Carolina, in the mid-1990s. An AV-8B Night Attack jet of VMA-214 ‘Black Sheep’ as it appeared in 1989. Working up during the 1991 Gulf War, the unit made a first foreign deployment with the AV-8B to Iwakuni, Japan, in October of that year. This AV-8B is illustrated carrying a mixed load of two AGM-65E Mavericks, a pair of Mk 20 Rockeye cluster bombs and AIM-9L/M Sidewinders for self defence. With the AV-8B, the U.S. Marine Corps took Britain’s first-generation Harrier vertical/short take-off and landing (V/STOL) design and brought this revolutionary aircraft fully up to date. Later aircraft feature radar for a further improvement in capability, and the Harrier II continues to serve aboard U.S. Navy assault vessels. As a first-generation V/STOL warplane, the Hawker Siddeley Harrier offered only a limited capability. However, the aircraft attracted the attention of the U.S. Marine Corps, which procured it in 1968 as the AV-8A. After gathering experience with the aircraft, the USMC began to pursue a more advanced development of the basic design, the AV-8B Harrier II. This was a joint project involving McDonnell Douglas (now Boeing) and British Aerospace and aimed to provide the Harrier with improved range and endurance as well as an increased warload. McDonnell Douglas designed an all-new wing that was both larger (with 14.5 per cent more area and 20 per cent greater span) with a supercritical aerofoil section. Other changes included an airframe that made use of carbon-fibre materials and a new cockpit based around hands on throttle and stick (HOTAS) controls. Various aerodynamic devices were added to improve lift and load-carrying. The initial YA-8B service test aircraft, which was a reworked AV-8A, flew in November 1978. Thanks to the new wing, which also possessed a reduced leading-edge sweep, the aircraft could now support six hardpoints, and its carbon-fibre structure trimmed weight. Additional weight-saving was provided by more efficient air intakes and carbon-fibre fuselage sections. Four pre-production AV-8Bs entered USMC testing in November 1981, paving the way for a first production delivery in 1983. The four pre-production aircraft and the first 12 production machines were powered by the F402-RR-404 engine before this was superseded by the 95.42kN (21,450lb) thrust F402-RR-406, equivalent to the Pegasus Mk 105. From the 44th aircraft, a digital engine control unit was fitted. With the 197th aircraft, another new engine was introduced in the form of the F402-RR-408, with an increase of thrust. In total, production for the USMC extended to 280 aircraft, to which were added six attrition replacements after Operation Desert Storm. The production total included the TAV-8B two-seat training version. From the 167th airframe, USMC AV-8Bs were delivered to Night Attack standard, which included a forward-looking infra-red (FLIR) sensor, an improved head-up display, a head-down display and a colour moving map. 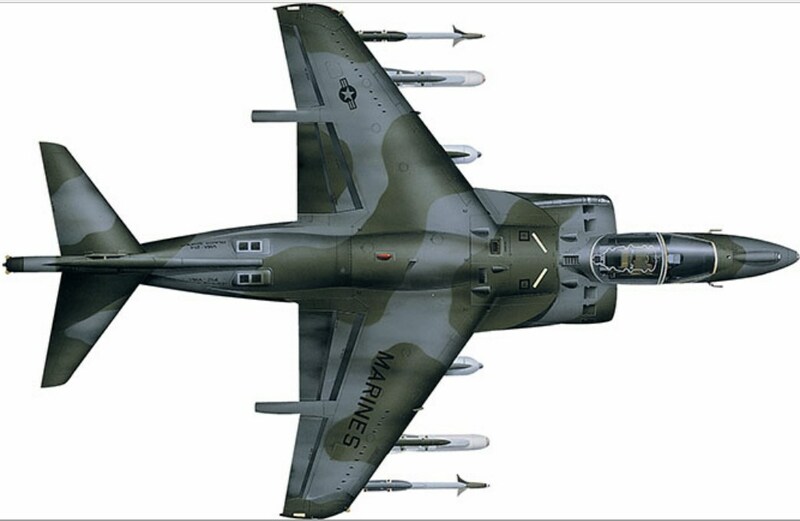 The first Night Attack aircraft was delivered to VMA-214 in September 1989 and the type went on to see operational service during Operation Desert Storm, in the course of which seven aircraft were lost. When the 205th USMC AV-8B came off the production line it was equipped to Harrier II+ standard, the main feature of which is the addition of an AN/APG-65 radar in a nose radome. First flown in September 1992, the Harrier II+ retains the FLIR sensor above the nose but this is now installed in a broader, squarer housing. The radar allows the Harrier II+ to deploy AIM-120 AMRAAM air-to-air missile, as well as the AGM-84 Harpoon in the anti-shipping role. 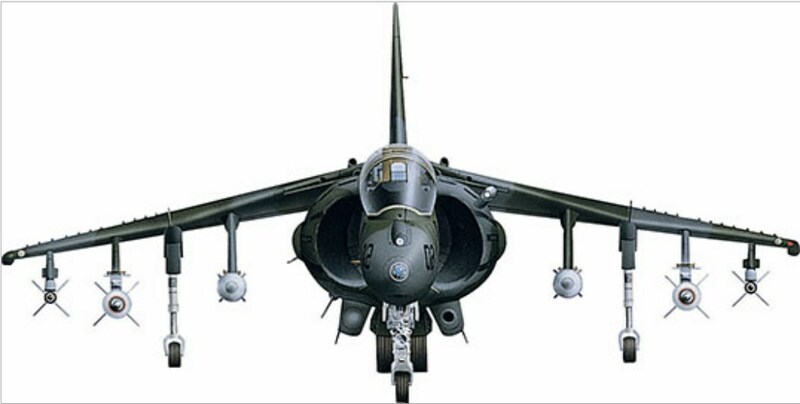 The USMC planned to receive the last of its 27 aircraft in Harrier II+ configuration, but in the event three of these were diverted to Italy, reducing the total to 24. A first Harrier II+ delivery took place in early 1993 and 73 earlier aircraft were also upgraded to the same standard. As well as the UK, which received locally built Harrier IIs in a variety of configuration from British Aerospace production, Italy and Spain both purchased the AV-8B from U.S. production. The Spanish Navy acquired the Harrier II to replace the first-generation AV-8S (locally designated VA-1 Matador) aircraft that operated from the carrier Dédalo. The 12 EAV-8B (VA.2 Matador) Night Attack aircraft first went to sea operationally aboard the Dédalo’s replacement, the Principe de Asturias. Most recently, they have served aboard the assault ship Juan Carlos. Spain also received one TAV-8B and placed follow-on orders for eight examples of the Harrier II+, and upgraded five earlier jets to this standard. Italy acquired two TAV-8Bs, followed by 16 AV-8B Harrier II+ ‘radar birds’, which initially served aboard the carrier Giuseppe Garibaldi, and more recently aboard the carrier Cavour. USMC AV-8Bs have seen extensive use in Iraq and Afghanistan and the aircraft is now subject to life-extension programmes, addressing the service life of the wing, the vertical tail and some of the subsystems. Life-extension work has focused on the F402-RR-408B powered aircraft, and the TAV-8Bs have also now received the uprated Dash 408B engine. In a bid to increase the AV-8B’s utility in its primary close air support mission, the Litening targeting pod has been integrated and this can be used to pass target coordinates to the aircraft’s GPS-guided Joint Direct Attack Munition (JDAM) bombs. A video downlink transmitter allows for real-time streamed video to be sent from the Litening pod to a ground station. In terms of weapon options, the 227kg (500lb) GBU-38 JDAM has been added to the armoury, while carriage of laser-guided bombs has been boosted through the addition of triple ejector racks. Dual-mode laser/GPS-guided weapons have also been added. In order to fulfil a role detecting improvised explosive devices (IEDs) laid by insurgents in Afghanistan, the AV-8B has also been equipped with the Intrepid Tiger II communications intelligence and jamming pod. The F-35B Lightning II will start to replace the AV-8B in 2016, and will replace the Harrier II entirely around 2025.